Macon Candy: See You on the Sweet Side: It's Not Another Pup, but it IS Mom's New Pet! One of the other aspects of Mom's life that kept her busy the last couple of weeks was the GIANT decision to buy a cute little car. Meet Mom's brand new Mini Cooper Clubman in "Hot Chocolate Metallic" with black bonnet stripes. 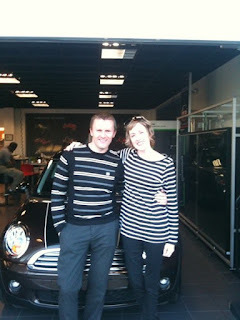 The folks at Mini of South Atlanta, in particular Sergei Antipov (her motoring advisor in accidentally matching ensemble), made it worth every penny. Mom built her dream car via the Mini site, and instead of waiting for it to be shipped in from the assembly line, Sergei found her one en route already. Mom felt like a 16-year-old being handed the keys for the first time. 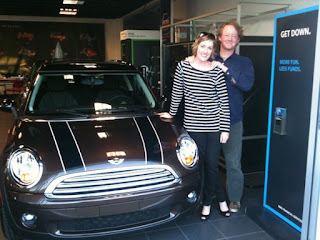 Except this time, she got the car she always wanted. She also found a good home for her car of almost 10 years, the Black Bean, her black 2001 Honda Civic EX (emphasis on the EX). Good-bye Bean . . . hello Coco. Shuga is smiling like the proud papa because he says he loves it when Mom knows and gets exactly what she wants.